Those of us on the lookout for edgy, racy content have heard the term “Joycean” thrown about with little discretion over the years. Critics appear to be more interested in using the term than they are in properly applying it to the product they are describing. The question that those of us driven to the source would have for Joyce, if he were still alive, is: Were your final two works the most erudite, most complicated pieces of fiction ever written, or were they a great practical joke played on the literature community to expose these reference makers and your elitist, scholars for who they are? Most readers that seek to up their erudite status by reading difficult books, have heard of Joyce’s final two works: Ulysses and Finnegans Wake. Even literary scholars list the books as some of the most difficult, most complicated works of fiction ever created. Some of us have attempted to tackle them as the challenge that they are, others have attempted to read them for entrance into their subjective definition of elite status. Most are confused and disoriented by the books, but some have the patience, the wherewithal, and the understanding of all of the references made, and languages used, in these books necessary for comprehension. Those readers either deserve a hearty salute, or the scorn and laughter that Joyce provided, as a gift, to the havenots, who openly admit that they don’t understand these books. I don’t understand either of these books, and I have gone back numerous times to try and further my understanding. Some have said that Ulysses is the more palatable of the two, but I have found it to be too elliptical, too erratic, and too detail-oriented to maintain focus, and I have purchased three different aides to guide me through it. Some of those same readers readily admit that Finnegans Wake is ridiculously incomprehensible. Andy Kaufman referenced James Joyce when trying to describe his method of operation. The import of the reference was that Kaufman wanted to be a comedian’s comedian, in the manner that Joyce was a writer’s writer. He wanted to perform difficult and complicated acts that the average consumer did not understand, and the very fact that they didn’t “get it” was what invigorated him. He wanted that “insider” status that an artist uses to gain entrée into the “in the know” groups. After achieving some fame, audiences began laughing with Kaufman in a manner that appears to have only bored him, and he spent the rest of his career trying to up that ante. By doing the latter, we can guess that there was something genuine about Kaufman’s path in that he was only trying to entertain himself, and his friends, and if anyone else wanted on board that was up to them. Perhaps, Joyce and Kaufman shared this impulse. Anytime an artist creates a difficult piece of work, there is going to be a divide between the haves (those that get it) and the havenots. When Mike Patton formed the band Fantomas, he never did so with the illusion that he was going to unseat the Eagles Greatest Hits, or Michael Jackson’s Thriller, atop the list of greatest selling albums of all time. He knew, or should’ve known, that he was playing to a very select audience. What is the audience for such difficult subject matter? Most people seek music, as either background noise, something to dance to, or something to tap their finger to. Most people read a book to gain a little more characterization and complication than a movie can provide, but they don’t want too much characterization, or too much complication. Most people only buy art to feng shui their homes. Most people don’t seek excessively difficult art, and those who do are usually seeking something more, something more engaging, and something more provocative that can only be defined by that individual. The audience for the difficult generally have such a strong foundation in the arts that they reach a point where their artistic desires can only satiated by something different. Different can mean different things at different times to different people. Different can be complicated, and discordant, but it can also be limited to style. At this point in history, it’s difficult to be different, in a manner that cannot be called derivative of someone or something, so most people seek whatever separations they can find. When the latest starlet of the moment twerks in a provocative manner, has a construction worker find her pornographic video, or accidentally has her reproductive organ photographed, we know that these are incidents created by the starlet, and her people, to get noticed after they have exhausted all other attempts to be perceived as artistically brilliant and different. There are also some other artists who are different for the sole sake of being different. This is often less than organic, and it often disinterests those of us seeking a true separation from the norm, because we feel that this has been thoroughly explored to the point of exhaustion. Andy Kaufman created something organically different that can never be completely replicated, in much the same manner Chuck Palahniuk, Mike Patton, David Bowie, Quentin Tarantino, and Jerry Seinfeld and Larry David did. Can it be said that James Joyce’s final two books were different in an artistically brilliant, and cutting edge manner that all of these artists were creations were, or were James Joyce’s writings more symbolism over substance? Put another way, was Joyce a substantive artist who’s true messages need to be unearthed through careful examination, or was he simply twerking in a provocative manner with the hope of getting noticed by the elite scholars of his generation after exhausting the limits of his talent in other works? Judging by his short stories, James Joyce could’ve written some of the best novels in history. Those that say that he already did, would have to admit that his final two works were not overly concerned with story, or plot. Those that defend his final two works would probably say that I am judging Joyce’s final two works by traditional standards, and that they were anything but traditional. They would probably also argue that the final two works sought to shake up the traditional world of literature, and anyone that dared to take up the challenge of reading these works. They would probably say Joyce sought to confound people, more than interest them, and if they did concede to the idea that the final two works were different for the sole sake of being different, they would add that he was one of the first to do so. Those that defend his final two works say that they are not as difficult to read, or as complex, as some would lead you to believe. These people suggest that reading these two works only requires more patience, and examination, than the average works. Anyone that states such a thing is attempting to sound either hyper intelligent, or hyper erudite, for it was Joyce’s expressed purpose to be difficult, complicated, and hyper-erudite. To understand Ulysses, one needs an annotated guide of 1920-era Dublin, a guide that describes the Irish songs of the day, some limericks, mythology, and a fluent understanding of Homer’s The Odyssey. If the reader don’t have a well-versed knowledge of that which occurred nearly one-hundred years prior to today, they may not understand the parodies, or jokes Joyce employs in Ulysses. Yet, it was considered, by the Modern Library, in 1998, to be the greatest work of fiction ever produced. “Everyone I know owns Ulysses, but no one I know has finished it.” —Larry King. To fully understand, and presumably enjoy, Finnegans Wake, the reader needs to have a decent understanding of Latin, German, French, and Hebrew, and a basic understanding of the Norwegian linguistic and cultural elements. The reader will also need to be well-versed in Egypt’s Book of the Dead, Shakespeare, The Bible, and The Qur’an. The reader also needs to understand the English language on an etymological level, for one of Joyce’s goals with Finnegans Wake, was to mess with the conventions of the English language. Some have opined that one of Joyce’s goals, in Ulysses, was to use every word in the English language, and others have stated that this is a possibility since he used approximately 40,000 unique words throughout the work. If this is true, say others, his goal for Finnegans Wake, was to extend the confusion by incorporating German, French, Latin, Hebrew, and other languages into his text. When he did use English, in Finnegans Wake, Joyce sought to use it in unconventional and etymological ways to describe what he believed to be the language of the night. He stated that Finnegans Wake was “A book of the night” and Ulysses was “A book of the day”. “In writing of the night, I really could not, I felt, use words in their ordinary connections . . . that way they do not express how things are in the night, in the different stages – conscious, then semi-conscious, then unconscious. I found that it could not be done with words in their ordinary relations and connections. When morning comes of course everything will be clear again . . . . I’ll give them back their English language. 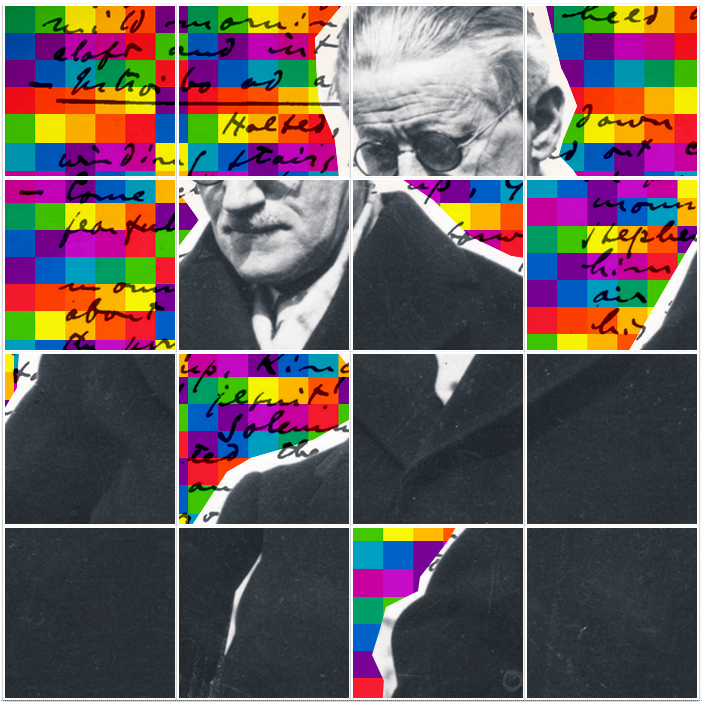 I’m not destroying it for good.” —James Joyce on his novel Finnegans Wake. This use of the “language of the night” could lead one to say that Joyce was one of the first deconstructionists, and thus ahead of his time by destroying the meaning of meaning in the immediate sense. Those obsessed with James Joyce could interpret the quote, and the subsequent methodology used in Finnegans Wake, to mean that Joyce had such a profound understanding of linguistics that normal modes of communicating an idea, bored him. He wanted something different. He wanted to explore language, and meaning, in a manner that made his readers question their fundamentals. Readability was not his goal, nor was storytelling, or achieving a best-seller list. He sought to destroy conventions, and common sense, and achieve a higher realm of perfect, in which timeless abstractions cannot be communicated to those that adhere to common sense. This makes for an interesting conversation on high art, and philosophy, but does it lend itself to quality reading? In the modern age, there is much discussion of the widening gap between the haves and the have nots. That particular discussion revolves around economic distinctions, as it has for time immemorial, but in the Joycean world, the gap involves those that “get” his works, and those who do not. Those that get it usually prefer to have deeper meanings shrouded in clever wordplay. They usually prefer symbolism over substance; writing over storytelling; and interpretation over consistent and concretized thoughts. “The hardest thing is to make something really true and sometimes truer than true.”—Ernest Hemingway. Those of us who have had a deep discussion, on a deep, multifaceted topic, with a deep thinker know that sooner or later a declarative distinction will be made if we stubbornly insist that we are not wrong. “You don’t get it, and you probably never will,” is something they will say in a variety of ways. We all know what it feels like to be summarily dismissed as an anti-intellectual by a deep thinker? Those who aren’t snobbish in an anti-social manner, often avoid openly dismissing you, but even the polite snobs give you a vibe, a look, or that chuff that is intended to let us know our place. “Well, what do you think of it then?” is the response some of us have given, after being backed into an anti-intellectual corner by deep thinkers. If they are an anti-social, elite intellectual snob, they will say something along the lines of: “I simply choose to think deeper!” It’s a great line, and it purportedly puts stubborn types in our place, but it’s a non-answer. Those of us who are more accustomed to interaction with deep thinkers, will then ask them to expound upon their complicated, deep thinking? Pushing deep thinkers deeper will often reveal a lack of substance beneath their piles of style, and the careful observer will find that the results of their deep thinking is no deeper than the deep thinker cap they wear to the pub. A number of attempts at reading Joyce have led me to believe that he probably didn’t have much substance beneath his piles of style, so he muddied the waters of his message with puns, songs, gibberish, abstractions, foreign languages, and overly complicated complications. He did this, in my opinion, to conceal the fact that when compared to his colleagues, he didn’t have all that much to say, but that he was artistically accomplished in saying it. If you just read those sentences three or four times, and you still have no idea what it says, and you just went back to read them again, because you want to be a have that “gets it”, you’re not alone. If these passages were merely anecdotal evidence of the difficulty involved in reading Finnegans Wake, that would be one thing, but these difficulties litter just about every sentence of every paragraph of the book, as evidenced by the exhaustive assistance provided at the site Finwake.com for readers that have no idea what this writer is writing about. Finnegans Wake is reported to be in English, but it’s not the standard version of English where words have specific meaning. The “language of the night” was intended for linguists who are tired of reading words that have exact meanings, and it was intended to be playful and mind-altering, and rule breaking. James Joyce made references that were intended to be obscure even to the reader of his day that may not have Joyce’s wealth of knowledge of history, or the manner in which the meaning of the words in the English language have changed throughout history. James Joyce was a stream of consciousness writer who believed that all “mistakes” were intended on some level that superseded awareness. In the 500+ page book, Finnegans Wake, Joyce found 600 errors after publication. He was informed of some, if not all of these errors, and he was reported to have fought his publishers to keep them in. Later editions were written to correct many of these errors, and provide readers “the book in the manner Joyce had intended.” If Joyce didn’t believe in errors, however, how can those that corrected them state that the corrected edition is the definitive edition that “Joyce intended”? There are three different versions of the text: The first and second are the editions that Joyce submitted for publications with all of the errors intact. The third edition has the errors that the editors located, and the 600 corrections that Joyce spent two years locating, corrected. Some would have you believe that first two editions are the definitive editions, but you have to be a Joyce purist to appreciate them. Can it be called anything short of egotistical for an author to believe that his subconscious choices and decisions, are somehow divine? If, as Joyce said, and Picasso later repeated in regard to his paintings, mistakes are portals of discovery, then we can say that’s great, and incredibly artistic in the process of creation. To leave it in the finished product, however, and subject your readers to the confusion, just seems egotistical. “Here’s what I was thinking at the time,” Joyce is basically telling his readers. “I don’t know what it means, but this is a higher plane of thinking than simple conscious thought. Isn’t it magical? Maybe you can make some sense of it. Maybe you can attribute it to your life in some manner.” This method of operation may say something profound about the random nature of the universe, but when we’re reading a novel we don’t necessarily want to know about the randomness of the universe, unless it’s structured in a manner that leads us to your statement. Not everyone can write a classic, and some realize this after a number of failed attempts. Once they arrive at this fork in the road, they can either write simple books that provide them and theirs an honest living, or they can grow so frustrated by their inability to write classics that they separate themselves from the pack through obscurity. The advantage of creating such an alleged contrivance is that beauty is in the eye of the beholder, and the beholder can assign their own relative beauty to it. Some would say this is the very definition of art, but others would say even that definition has limits. Some would say that the most obscure painting is art, because they “see it”, where others see only schlock for elitists to crib note to death, until meaning is derived. James Joyce is considered the exception to this rule, fellow writers have told me, and if you are going to attempt to write an important novel in the 21st Century, you had better be familiar with him. I’ve tried, and I now believe that I’m destined to be a havenot in the Joycean world … Even with Ulysses. The question that arises out of these ashes is, am I going a long way to becoming more intelligent by recognizing my limits, or should it be every aspiring intellect’s responsibility to continue to push themselves beyond any self-imposed limits to a point where they can finally achieve a scholarly understanding of difficult material? If this is a conundrum that every person encounters when facing challenges to their intelligence, is Ulysses, or more pointedly Finnegans Wake, the ultimate barometer of intelligence, or is it such an exaggerated extension that it had to have been a practical joke James Joyce played on the elitist literary community to expose them as the in-crowd, elitist snobs that they are when they “get it” to get it. Do they really “get it”, or are they falling prey to Joyce’s clever ruse to expose them as people that “get” something that was never meant to be “got”? There’s no apostrophe in Finnegans Wake. I have gone back and deleted the two occasions where the apostrophe was left in. In my defense, the only times I missed those were in the hyperlinks. I realize that Joyce wanted no apostrophe, but it was hard to get used to that while writing this. Thank you for the corrections though.